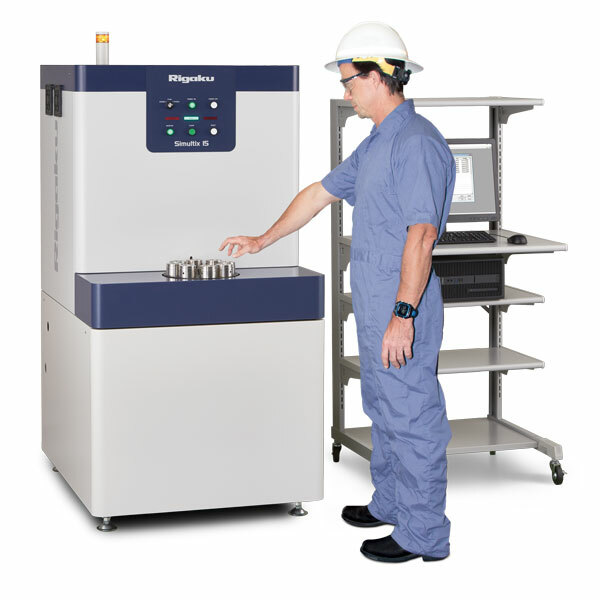 The Simultix 15 is latest generation simultaneous XRF spectrometer combining both speed and accuracy. It is suited to high throughput applications such as industrial process control, steel, cement, etc. With over 1000 Simultix installations around the world, the Simultix 15 has evolved to cater for the changing needs of industry. The now offers significantly improved performance, functionality and usability, making it a powerful tool for elemental analysis. for analysis of other elements or an XRD channel for phase analysis. Higher levels of automation and throughput are possible using the (optional) 48 position automatic sample changer. Alternatively, the optional Sample Loading Unit can be used to load samples directly from third party sample preparation systems. The Simultix 15 simultaneous XRF differs from most other WDXRFs in that it measures all elements at the same time. Most other “high throughput” systems measure each element sequentially using a scanning goniometers and analysing crystal changer. In contrast the Simultix 15 is configured to your requirements using a set of fixed channels to measure elements specifically of interest to you. Synthetic RX-Series multi-layer crystals – The new synthetic multi-layer RX85 crystal produces about 30% greater intensity than existing multi-layers for Be-Kα and B-Kα providing enhances light element sensitivity. XRD channel – The XRD channel allows you to perform both quantitative XRF and XRD analysis. Doubly curved crystal – Fixed channels can be fitted with doubly curved crystals resulting in increased intensity. Improved user interface – Operation of the Simultix 15 has been improved using the same quantitative analysis flow bar same as the ZSX software. Heavy and light scanning goniometer – The optional wide elemental range goniometer supports standardless semi-quant (FP) and can be used for qualitative or quantitative determination of non-routine elements. BG measurement for trace elements – Optional background measurement (BG) for fixed channel, results in improved calibration fits and superior accuracy. Automatic Pressure Control (APC) – The optional APC system maintains the chamber at a constant vacuum pressure dramatically improve light element analysis precision. Quantitative scatter ratio method – When analysing ores and concentrates utilising the Compton scattering ratio method, the optional quantitative scatter ratio method generates theoretical alphas for the scattering ratio calibration. Up to 40 fixed channels – Standard 30 fixed channel configuration that may be optionally upgraded to 40 channels. Automation – Optional Sample Loading Unit provides belt-in feed from a third party sample preparation automation system. Click here to download the Rigaku Simultix 15 simultaneous XRF spectrometer brochure.